Halloween musters feelings of magic and mystery. In the spirit of this spooktacular season, join ASPI as we take a look back at some of our most frightful, fantastical, and mysterious productions! 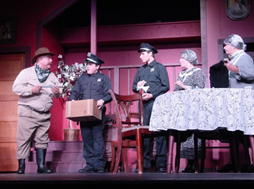 Let’s start with our 2012 production of Arsenic and Old Lace starring Bill Wons as Mortimer Brewster. Mortimer must figure out a way to deal with his homicidal aunts, Abby and Martha Brewster (played by Karen Fuller and Sharon Fischer, respectively) who kill off lonely old men with a drink of elderberry wine laced with arsenic. Mix in a waiting fiancée, one brother who thinks he is Teddy Roosevelt, and another brother with ill intentions and you’ve got a dark comedy that will make you think twice about accepting that glass of elderberry wine. Let’s go back a little further with our 2010 production of CLUE: The Musical. Go from the board game to the actual scene of the crime. Who killed Mr. Boddy? 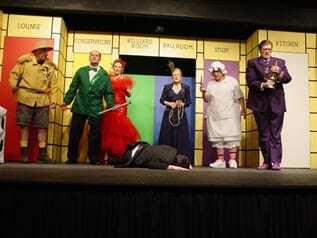 The cast of iconic characters included Bill Koehne as Mr. Boddy, Linda Druckrey as Mrs. Peacock, Brandon Byng as Professor Plum, Suzie Wons as Miss Scarlett, Jerard Nighorn as Colonel Mustard, Sharon Fischer as Mrs. White, and Bill Wons as Mr. Green. 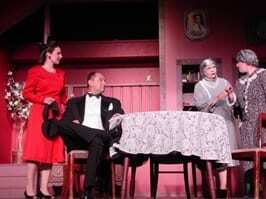 This interactive musical comedy had the audience deducing from clues as the actors went from room to room. Was it Mr. Green in the conservatory with the revolver? Only the cards know! This entry was posted in Uncategorized on October 27, 2017 by packerland.